27' Round Boulder Swirl Overlap. Aboveground Swimming Pool Liner 25 Mil. At SOPS, our Aboveground Pool Liners are made from the finest 100% virgin vinyl, and will stand up to years of wear & weather. The overlap liner is the most common type of aboveground pool liner. Your liner simply folds over the corrugated metal wall and drapes down on the outside of the wall. Once the liner has been taken out of the box, the liner is not returnable. Please make sure you measure your pool before purchasing the liner. Don't forget about purchasing happy pool bottom, wall foam and pool cove. The Most Advanced Processing High Temperature Curing, Computer controlled process insures that 100% of the material is "Vulcanized" to the highest possible tolerances. Vacuum Sealing, high volume air pumps combined with electronic air filters remove all impurities before bonding. Quality Control Inspectors, inspect every liner during the welding process. Reduced Wrinkling - Hand folded flat to reduce wrinkles, unlike automated packers that twist and force the liner into the box which can cause permanent creasing. How To Measure For A Liner. In your aboveground pool measuring your pool for a new liner is a simple process. On a round pool you simply get a measuring tape and take 2 measurements. Go from inside the pool at the bottom of the wall and measure directly across to the other side at the same height. Do this in two locations in the pool so you get the same measurement. Some brands of pools use a special bead that we can make for you as a special order. Most pools can utilize the standard bead that is common in the industry. Better to be safe than sorry. Incidentally, you can change your overlap liner to accept a beaded liner by simply adding bead receiver strips to the order. This way, if you need to change the liner in the future, you do not have to remove the top seats of the pool. This is a real timesaver and is much easier to reinstall liners. J-Hook & V-Bead are liner types that have a thicker open flap top that inserts over the corrugated metal wall. It looks likes the plastic coping we use to hold an overlap liner over the metal wall except that, in this case, it is attached to the top of the liner. If you are using an overlap liner and your pool is a flat-bottom, you can use the V-Hook or the J-Hook type liner. Note: This information is intended to answer many questions you may have regarding the type and size liner you may need. We're happy to help! We are unable to make changes or cancellations to orders after they are placed. We do not offer local pickups. Oversized deliveries are curbside only. Save On Pool Supplies now delivers on Saturdays for no additional charge. If the combined weight of your order is 500 lbs. At Save On Pool Supplies , we strive to provide you with high quality products and are here to assist you before and after the sale. Damaged items: We inspect all packages for damage before they leave our warehouses. We reserve the right to require photos or samples of damaged or defective merchandise be sent to us. We cannot stop, cancel, or revise any order. We are a full service company and are here to assist you. We look forward to serving your needs! We answer all emails received, however in season due to the heavy volumes we experience there may be a delay in our response. The item "27' Round Boulder Swirl Overlap Aboveground Swimming Pool Liner 25 Mil" is in sale since Wednesday, February 10, 2016. This item is in the category "Home & Garden\Yard, Garden & Outdoor Living\Pools & Spas\Pool Equipment & Parts\Pool Liners". 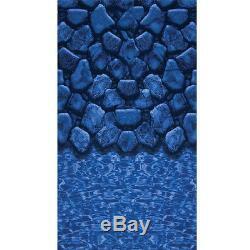 The seller is "saveonpoolsupplies" and is located in United States. This item can be shipped to United States.